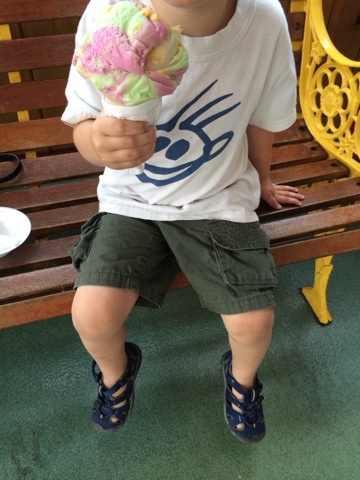 East End Pioneer: Ice Cream Factory Outlet: A New Old Danforth East Gem! Ice Cream Factory Outlet: A New Old Danforth East Gem! Half-way through the summer, and half-way through a heat wave, so no doubt that general enthusiasm for ice cream is wearing thin. However, we've uncovered another neighbourhood gem that is just too delicious to keep to ourselves! 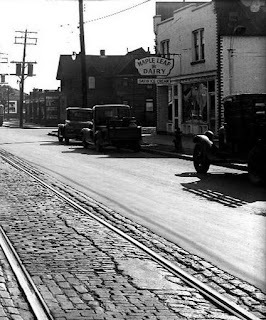 Like Pioneer, we're sure many of you have driven east of Main on Danforth and noticed the "Ice Cream Factory Outlet" sign hundreds of times and for one reason or another filed it away for later. We finally decided to make later a reality and investigate. St. Clair Ice Cream aka Maple Leaf Dairy at 2861 Danforth is both an ice cream parlour stuck in time, and a real ice cream factory that has been in operation on the Danforth since at least 1936. Their original location (of course!) was on St. Clair. The company makes thousands of litres of fresh ice cream in dozens of flavours. If you're tired of the regular options at neighbourhood spots, we highly recommend heading here to try one of the 30 or 40 options: Salty Caramel, Strawberry Cheesecake and Ginger among the more original. Pioneer loves a good deal, so discovering a kids cone is only $2.50 was a treat. However, our eyes almost fell out of their sockets when we discovered just how good a deal this really is: the serving size is almost the size of small bowling ball. It seemed like there were at least three scoops dripping off Junior's rainbow sherbet cone (which became so messy we needed a bowl and a spoon!). We watched in horror as someone ordered a large, which is so much ice cream that even running a marathon wouldn't burn it off. The bad news is that this new 'old' local gem is only open seasonally, so literally, get it while it's hot! Or you'll have to wait until next year. Danforth East Mural: It's Done!